Intuition is the ability to understand something immediately without the need for conscious reasoning. It can help you to avoid dangerous situations or to recognize opportunities. Or, it can kill you. Let me give you an example. Intuition kills dozens of pilots every year. One of the first things that pilots learn is what happens when they pull or push on the yoke or stick in an airplane. Pulling back on the stick raises the nose. With sufficient power, the airplane will climb. Pushing forward on the stick or yoke lowers the nose and causes the airplane to descend while increasing airspeed. Pilots can get into trouble if the airplane suffers an engine failure while close to the ground. Without power, an airplane is a glider. If the yoke is pushed forward slightly to descend and maintain the necessary airspeed, the airplane can be brought down under control. Pilots get into trouble though, when their intuition takes over. What do you think a pilot’s intuition is telling the pilot as the ground rushes up during an emergency? The natural inclination is to get away from the ground by pulling back on the yoke. When you don’t have sufficient power to climb and you raise the nose of the airplane, airspeed decreases. If the airspeed decreases below stalling speed, the airplane quits flying, in other words, it stalls and falls. The pilot must keep the airplane under control and prevent a stall. That means keeping the nose pointed down in the direction the pilot does not want to go, a move which is counterintuitive. Intuition says to pull back on the stick to get away from the ground, but that intuitive move kills a lot of pilots when they stall the airplane and crash. There is only one way to override intuition and avoid the deadly scenario I just described: Training. There is a word used to describe the vast majority of medical sales representatives who sell by intuition – average. Their intuition might serve them well part of the time, but often it is counterproductive. The problem with intuition in sales is that most sales people’s intuition is telling them to do the same thing every other sales rep is doing. That is a poor way to differentiate your product and yourself. The only way to overcome the intuition that holds back sales performance is through training. Yet, the vast majority of medical sales people I have met in more than 30 years in this industry resist training. Why? Again, the answer is intuition. Their intuition tells them that they don’t need training because they think they know what to do. 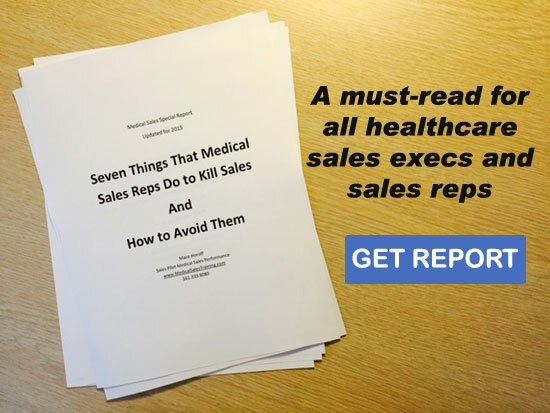 Too often, medical sales reps find themselves in situations where the ground is rushing up at them and their intuition causes them to do the wrong thing and crash. Like most medical sales representatives, I resisted coaching and training for years. With a strong academic background in anatomy, physiology, and pathology, I thought I could outsell my competition. It took me a while to learn that my medical knowledge was useful, but it meant little when compared to effective selling skills and strategies. Once I learned the benefits of countering intuitive sales behavior, I became a training fan forever. It’s one of the reasons I do what I do. The revelation occurred when I sought help to capitalize on a rare opportunity in my territory. The orthopedic implant business in one of my accounts was up for grabs. One competitor owned this business for years. His company charged more for implants than five other companies that responded to a request for proposal. The hospital’s goal was to get the orthopedic surgeons on staff to switch to a lower priced implant system. The hospital invited representatives from all six orthopedic implant companies to present to its surgeons. My intuition was telling me to give the same sales presentation I always gave because I thought it was great. Then it occurred to me… my five competitors would be doing essentially the same thing. That wasn’t good! Since there was over $1 million worth of business on the line, I pushed my ego aside and sought help. I called Ned, a sales trainer who spoke at a company seminar I had attended. I described the scenario. “There will be 10 orthopedic surgeons sitting in a room. I need to give them a reason to switch to my system. The truth is, though, my hip and knee systems aren’t all that different from what the surgeons are already using. Our price is a little lower, but so are four other companies who are also under consideration. Without hesitating, I responded. “I’m going to go in and show them how the science behind our implants makes it a superior system. I will discuss nuances that my competitors don’t have or are incapable of discussing.” My intuition was telling me that science was important to surgeons. Ned’s next question, made me rethink that. “Not very, although they acknowledged the science made sense,” I replied. Ned and I spent a few hours discussing several strategies. He had me practice exactly what I would say in different situations, keeping the focus on long term outcomes and not just this particular event. 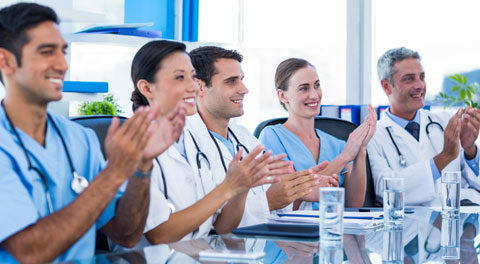 The surgeons asked questions and seemed to pay attention during the first three presentations, but by the fourth, they were looking at their watches. You could tell that most were thinking about something else. They just wanted this dog and pony show to be over. Finally, it was my turn. The only chance I had to make an impression was to be different—dramatically different. So I began by calling out the elephant in the room. At this point I had the absolute attention of every person in the room, including the evil eye of the committee chairman who looked at me with disbelief. I continued. I received a round of applause from the surgeons. It was probably more for ending their suffering by being short, but in the coming days, several acknowledged me for saying what they were thinking at that meeting. You’re probably wondering if I won the business. Sadly, the answer is no. The company, who had almost all of the business to start with, got to retain it, albeit at a much lower price. What did I get out of my counterintuitive non-presentation? Respect and open doors. I had unlimited access to all the surgeons from that point forward because they knew I wouldn’t waste their time…and I didn’t bore the crap out of them like every other sales rep who came into their office and droned on endlessly about their products. Over time, this allowed me to steal significant chunks of business from my competition. My intuition said to do what every other rep did, who by the way, were also acting on intuition. Yet, a medical sales trainer named Ned showed me how dangerous intuition could be, including the intuition that led me to assume that I was already good and didn’t need additional sales training or coaching. From this point forward I invested in every type of training adaptable to medical sales. Most medical sales representatives sell intuitively, which makes it difficult for them to distinguish themselves and their products from the competition. Sameness is the kiss of death in medical sales and the only way to overcome the intuitive response that creates it is with effective training. If you’re not investing time and money to update your medical sales skills on a continual basis, average is about the best you can hope for.